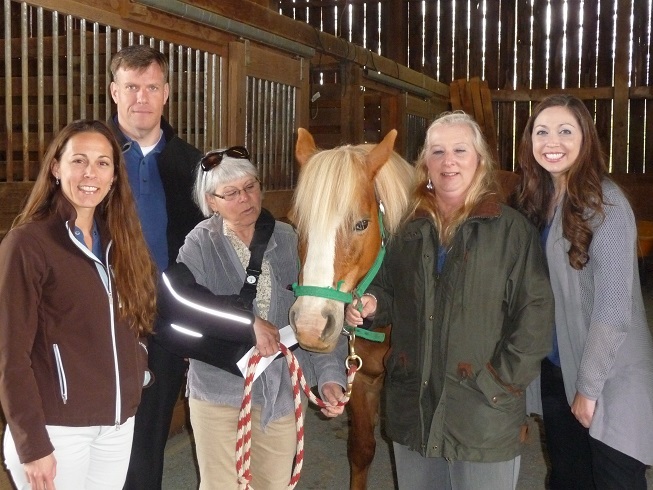 American Woodmark Foundation Team members visited the BRCTH farm on April 22 to present a grant, where they met Honey, a pony used in the therapeutic riding program. From left, Christy Foltz, team secretary; Kevin Dunbar; Marjorie Youngs, BRCTH; Becky Sine; and Jennifer Frye, team leader. The Blue Ridge Center for Therapeutic Horsemanship will soon improve its ability to connect with students, recruit volunteers, and partner with other community organizations through cloud-based software, thanks to a grant from the American Woodmark Foundation. The grant, for $2,160, allows BRCTH to purchase DonorPro software for one year. Representatives from American Woodmark Corporation presented the check to BRCTH on April 22 when they visited the farm in Berryville from which the center operates. The American Woodmark Foundation supports nonprofit organizations in communities with company facilities. The company, which manufactures cabinets, has its headquarters in Winchester. This is the fourth grant that BRCTH has received from American Woodmark, with previous grants for start-up costs, insurance and equipment. BRCTH is a 501(c)(3) nonprofit organization with the mission to provide life-enhancing, equine-assisted activities for children and adults with disabling conditions. Students benefit from improvement in their physical, cognitive and psycho-social skills. BRCTH is a member of the Professional Association of Therapeutic Horsemanship International, and its instructors are PATH certified. The Center relies on a large cadre of volunteers who help with the riding programs and care and management of its therapy horses and ponies. For more information, go to http://www.brcth.org and find us on Facebook.